Located in southern Vermont, Magic Mountain has long been known for its steep terrain and unique trails. 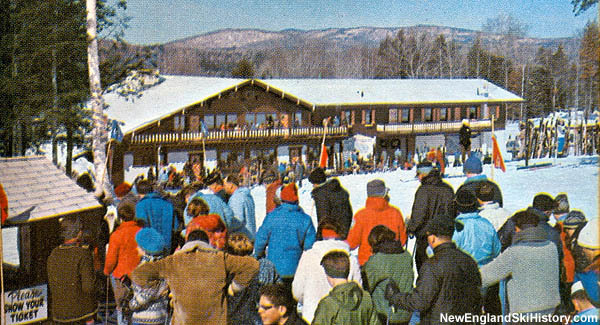 Started by Hans Thorner as a small surface lift ski area in 1960, Magic Mountain grew to become one of the largest ski areas in Vermont in the 1980s, absorbing nearby Timber Ridge in 1987. After decades of working in the ski industry, Swiss ski legend Hans Thorner decided something was lacking when skiers left American ski areas following a day on the slopes. His vision was to develop a ski area with a Swiss-like village where guests could particpate in apres-ski activities. Joining with William Ingraham, Thorner settled on Glebe Mountain in Vermont for his resort's location. Wanting to capture the dream-like feeling of the famous Thomas Mann book, the name "Magic Mountain" was chosen. The ski area started off modestly in 1960-61 with a T-Bar, one trail, and two slopes. Bad luck struck during the following season, as a planned chairlift installation was postponed and the base lodge subsequently caught fire. Magic Mountain finally started to live up to its potential when a $300,000 Pohlig double chairlift was installed for 1962-63, opening the Upper Mountain. In 1963-64, William Ingraham started his own ski area on the other side of the mountain, initially called Glebe Mountain Farm. The ski area later became known as Timber Ridge. 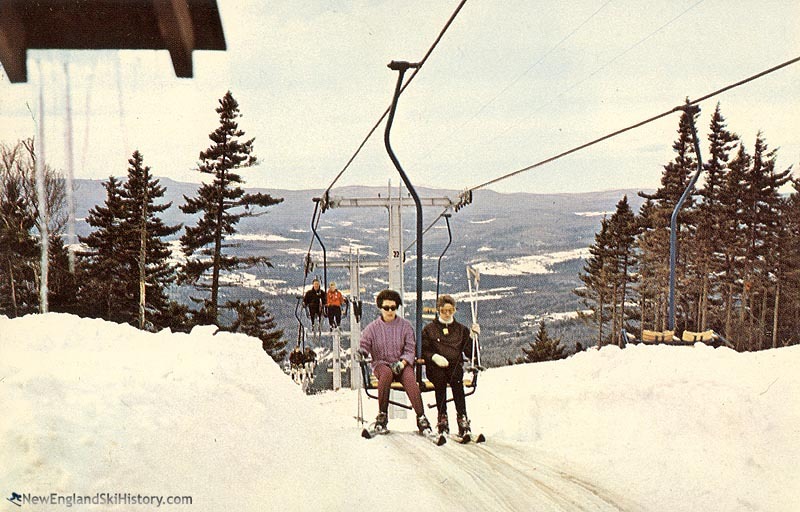 A novice chairlift was installed at Magic for the 1964-65 season, serving the new Hocus Pocus beginner area. For the 1967-68 season, 3 new trails were added, along with a new ski patrol building and a base lodge addition. The following season, $250,000 was spent to install snowmaking on the lower half of the double chairlift area, as well as on the Hocus Pocus novice slope. A big expansion took place for the 1971-72 season, when the so-called Summit Area was opened with the installation of a new Heron-Poma double chairlift. In the midst of a string of multiple bad winters in the late 1970s and early 1980s, Magic attempted to raise money for top to bottom snowmaking by selling 33 year season passes. In addition, a 50 foot wind turbine was installed atop the mountain. After a quarter of a century of ownership, Hans Thorner sold Magic Mountain in 1985 to a group led by Simon Oren. For their first winter, the new ownership likely upgraded the aging Black Chair from a double to a triple. 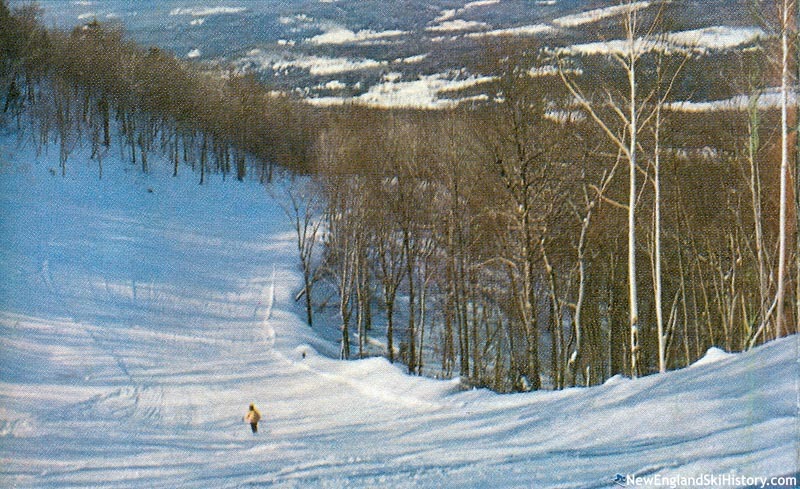 In 1986, the group purchased defunct Timber Ridge. Big changes were in store for the following season. For 1987-88, Timber Ridge ski area was connected to Magic and renamed Timberside. The combined ski area, advertising 72 trails and 6 lifts, was called the Magic Mountains. In addition to the new terrain, a new Poma triple chairlift replaced the original Magic T-Bar, serving novice and intermediate terrain. Finally, as the season neared, the ownership group purchased nearby Bromley from Moore and Munger, Inc., the owners of Stratton. While Magic was being modernized, it wasn't fast enough. The winter of 1988-89 was so lean that the connecting trails between Magic and Timberside were seldom, if at all, open. In 1990, Oren sold his remaining interest in the company to partners Joe O'Donnell and Petros A. "Bob" Palandjian. Following the 1990-91 season, the decision was made to shut down both Magic and Timber Ridge. In the spring of 1993, the owners decided to put Magic and Timber Ridge on the auction block. The Bank of Boston foreclosed on the resort that spring. 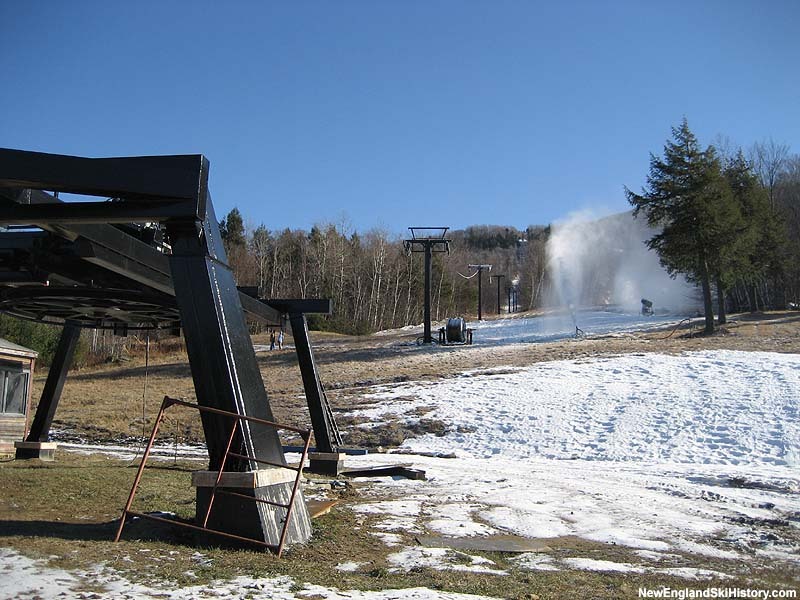 By the middle of the decade, both lifts at Timber Ridge were gone, along with the Sun Corner Triple and Little Chair at Magic. The area reopened without Timberside in December of 1997 with one triple chairlift, one double chairlift, and a new tubing park. While management was able to keep the ski area operating, it found itself unable to consistently make payroll or pay its bills. Facing mounting debt, a new ownership company was formed in November of 1998, named Old Fashioned Skiing Company, LLC. The new company, with some 40 owners, soon amassed tens of thousands of dollars in back taxes and penalties, prompting a foreclosure auction. John Nelson, whose family had owned a home at the mountain for decades and was reportedly owed $1 million, purchased the area with four partners in August 2002 for a reported $500,000. Around this time, two used chairlifts were acquired. One was partially installed in 2003, but never completed. James Sullivan took over operations of Magic Mountain in September of 2006. In 2009, plans to transfer the area to a cooperative setup were announced. After much effort in fundraising, the co-op recorded its 333rd share purchased in 2012, unlocking nearly $1 million capital for improvements. 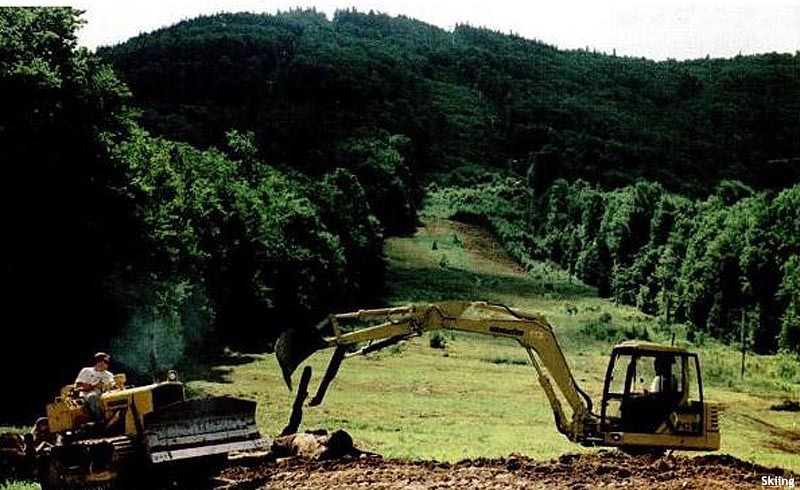 In June 2014, property owner Tom Barker took over operational control of the ski area from James Sullivan and JLS Magic, LLC. While a subsequent ownership change was announced during the summer of 2015, the deal initially fell through. Negotiations resumed in the spring of 2016 with Ski Magic, LLC finally acquiring Magic in the fall of 2016. Upon purchasing Magic Mountain, Ski Magic made significant investments in existing infrastructure. In 2018, Ski Magic announced a bold plan to install two chairlifts for the upcoming season, including a fixed grip quad. "I had the pleasure of working Winters in the Ski Shop for the Frank family 1963-1966. Loved skiing there and returned in 1967-68 when I was home. I loved working there and developing my people skills. I also got to ski the other side of the Mountain because I went to school with the Ingraham boys Ted, Dave, and Peter. I guess I was fortunate because I don't remember any of the years having a lack of snow." "started skiing here in 1965 with my family of 7....it was an expensive sport for a family but my parents thought it was an important family activity. the best memories....we knew Hans and all the instructors. used to stay at the Snowden Motel....wonderful times!" "I loved skiing here in the 1970's growing up-night skiing. I love the grand ol' two seater red lift to the top. At 6'4' hard to get the knees and legs on the bar. slow to top, maybe 10 minutes but great views to while the time away. A real `throwback' mountain that is a pleasure to ski even today! Love the `throwback' special days. Great job bringing back Magic!" "Been going here since I was 6. Always my favorite place to go. This year is gonna be LIT"
"I was a ski instructor at Magic Mountain on weekends from 1964 to 1974. We had a house in Vt at Timber Ridge. I have wonderful memories of Hans Thorner and his family and all my old friends in Londonderry VT. Best time of my life!!" "William 'Bill' Ingraham was a partner with Hans Thorner in the founding of Magic. I recall their planning sessions in Bristol, CT. The fire in the first year of operation also took out the T-bar lift but they continued operations ferrying skiers to the top in the snowcat. Bill Ingraham spilt ways with Hans early on and started Glebe Mountain later to be Timber Ridge on the backside of Magic." "I skied Magic Mountain for the first time 3/1/2015. Me and my two sons. We are all good skiers. I loved the place. It reminds me of a old ski area. Very challenging and great snow. Not overly groomed and narrow trails. It is truly a skiers mountain. There were some snowboarders but they were into cruzing and we all got along great. I can't remember when I had more fun on the slopes. No crowds and very friendly operations staff. "